So I have a very big obsession with Microsoft, and more with Windows. I had always wanted a tattoo but, at first, didn’t know what to get or where to get it. Finally I figured the Windows flag would be perfect for me since I’m such a fanboy. For about a year or 2 I told everybody my idea, and most people thought it was stupid. Well finally, 1 person told me it was an awesome idea: my current girlfriend. We work at the help desk at LSU and I was training her one day and told her my tattoo idea and she LOVED it. The next week, I didn’t tell anybody and got it. I then updated Loopt and said “At Deja Vu” (Deja Vu was the tattoo parlor) and my girlfriend called me immediately when she saw that and freaked out. It was great. 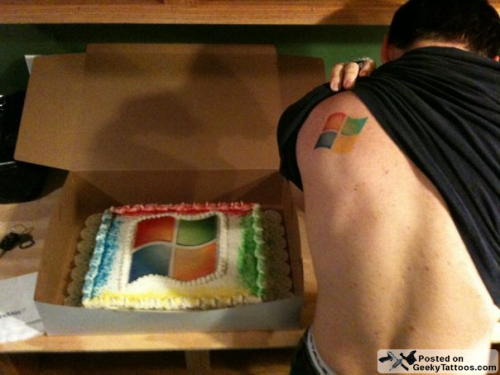 Oh, and the cake is from a Windows 7 party I hosted at my house when it launched. Not only did he get an incredibly geeky tattoo, he also checked in with Loopt, a location sharing service, for extra geeky points! Personally I’m a Dodgeball Foursquare fan, but I won’t hold that against him. Tagged with back, Deja Vu, shoulder blade, Windows.